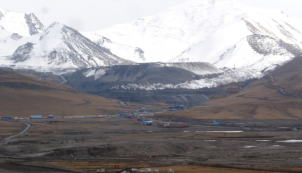 Canadian gold mining in Kyrgystan. Gold mining expert Robert Moran, who also adviced EJOLT partner Za Zemiata in Bulgaria in 2011 in their work with the local population against the planned Krumovgrad gold mine, now reports on a gold mine in Kyrgistan which is detroying glaciers, in a case that recalls mining by Barrick Gold in Pascua Lama in Chile. Kumtor Gold has mined out parts of two local glaciers (Davidov and Lysyi) to access the ores the company has been disposing waste rock on the glaciers, aggravating their melting and thus threatening the entire local water system whose main source are the glaciers mining uses roughly 4.38 billion litres of water per year, seriously increasing competition for this scarce resource in Central Asia Petrov Lake, at the same time the biggest regional contributor to trans-boundary Naryn River and the mine’s main water source, is being polluted the water returned to the hydrological system after mining is polluted: water testing has shown that numerous chemical pollutants have high concentrations around the mine area, sometimes exceeding international water quality standards; local fish populations have been decreasing since mining began, Kumtor Gold has produced 89 million tons of tailings, some of which are deposited in unstable conditions potentially causing a hazard in case of an earthquake; yearly, the company uses about 3650 tons of cyanide whose concentration in the waters released from the mine is unstudied access to information for the public is restricted while state authorities do not have the means to properly monitor the company. “Kumtor Operating Company controls the mine like a private fiefdom, restricting access only to its close associates,” says Robert Moran. “Despite claims by Centerra and the European Bank for Reconstruction and Development – which is financing Centerra and should be monitoring its practices – the company does not truly allow open access to outside technical experts with respect to water quality testing.” Last fall, Moran was invited by Kyrgyz environmental NGOs to join a state commission visiting the mine to conduct an independent technical audit. Nevertheless, finally Moran’s entrance to the mine was refused by without an explanation. “Our expert commission identified a whole set of problems and risks at the Kumtor mine so we provided many recommendations and even advised to temporarily suspend operations until further analyses are conducted and the problems are solved,” says Kalia Moldogazieva, deputy head of the state commission and “HDC Tree of Life” director. “The situation at the mine is very serious: even though we doubt operations will be halted, we at least hope the company will take on board our advice and start addressing the problems urgently.” The European Bank for Reconstruction and Development has been providing debt and equity financing to Centerra Gold since 1995, yet the bank has failed to reassure critics of the Kumtor mine by providing transparent information about the mine’s impacts or the company’s performance and compliance with environmental and social standards. In spite of repeated serious accidents at the Kyrgyz mine and numerous accusations of bad practices, in November 2010, the EBRD decided to support Centerra Gold with a 150 million US dollars three-year revolving debt facility (i.e. the EBRD will provide the funds on demand from Centerra).